The Keysight B2901A is available to buy refurbished used or rent, usually from our UK stock. Click here to download the Keysight B2901A datasheet. 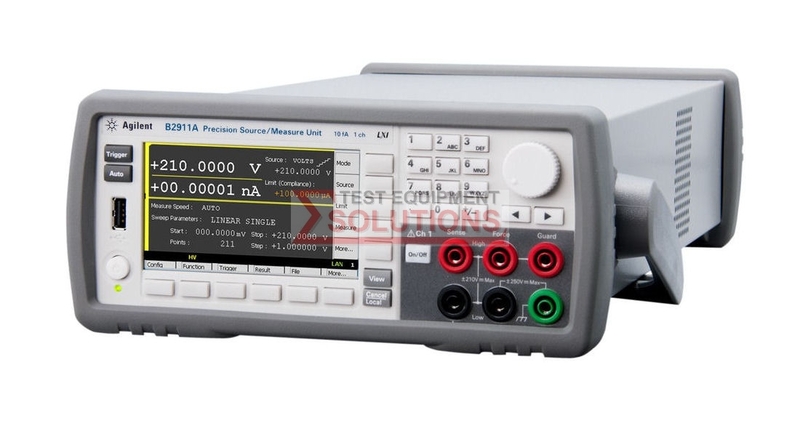 The Keysight B2900A Series of Precision Source/Measure Units are compact and cost-effective bench-top Source/Measure Units (SMUs) with the capability to source and measure both voltage and current. These capabilities make the B2900A Series ideal for a wide variety of IV (current versus voltage) measurement tasks that require both high resolution and accuracy. We offer the refurbished used Keysight (Agilent) B2901A Precision Source/Measure Unit, 1Ch, 100fA, 210V, 3A Dc/10.5A Pulse for sale and rental. The Keysight B2901A is fully tested and refurbished in our in-house ISO9001 calibration laboratory. We supply manuals, accessories, full warranty and a free-of-charge Certificate of Conformity. We can also provide the Keysight B2901A with a fresh calibration for a small additional charge. If you have under-utilised test equipment talk to us about trading-in or part-exchanging it towards the Keysight B2901A or other refurbished test equipment.